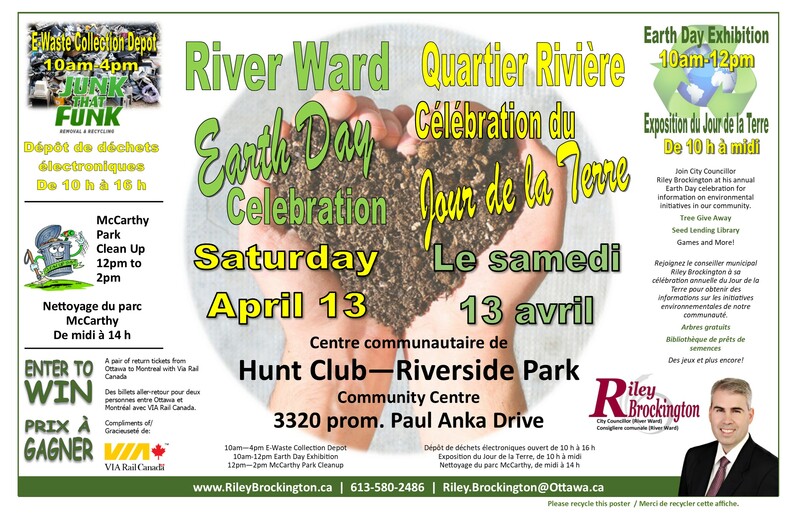 On Saturday April 13, I will host my annual Earth Day event at the Hunt Club-Riverside Park Community Centre, 3320 Paul Anka Drive. This will be an all-day event featuring an electronics waste collection depot from 10am to 4pm courtesy of Junk that Funk. They will be set up in the parking lot to receive your electronic waste. 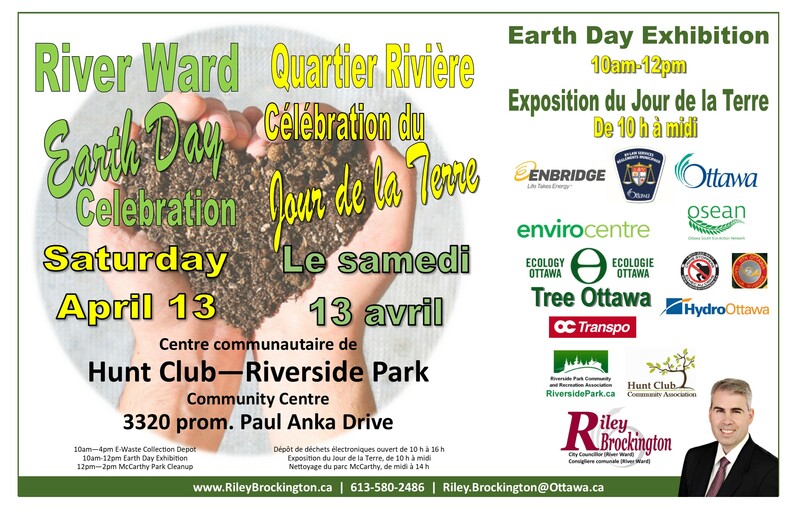 From 10am to noon there will be an Earth Day Exhibition inside the community centre with numerous community partners participating and featuring a TREE GIVE AWAY with Tree Ottawa, the Seed Lending Library with Just Foods (Community Gardens), games and information with Ottawa South Eco Action Network, information from the City of Ottawa on the Green Bin Program and Clean the Capital, and much more! Don’t forget to enter the draw to win a pair of ticket to travel to Montreal and back courtesy of Via Rail Canada. The Ballot box will be on my table at the Exhibition and the draw will take place at noon. In the afternoon, join me for a park cleanup of McCarthy Park. Depending on the weather, it may vary from a garbage pickup to a full park clean-up. If the snow is gone, bring your rakes!